It’s here! After, gosh, 3 or 4 months of designing, crocheting, and procrastinating, I’m sooo excited to finally share my finished Zoodiacs c2c crochet afghan with you all. Can I tell you how much I am in love with this blanket? And it’s not just because I spent so much time on it; it’s because it’s HUGE, and sooo comfortable! My whole family fights over who gets to nap under this thing, and it’s the perfect oversized couch blanket. 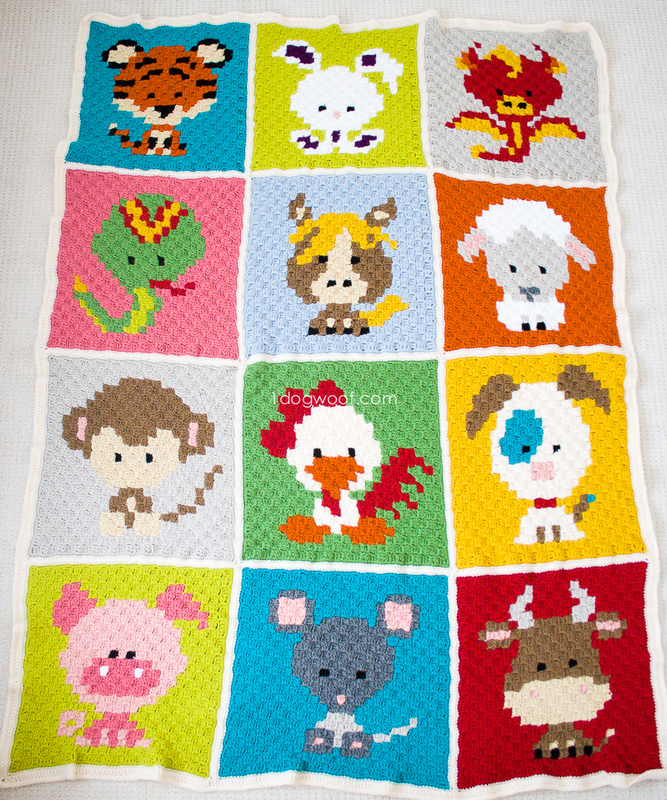 This blanket is made from 12 large c2c (corner to corner) crochet squares that depict the animals in the Chinese Zodiac. My son is a Tiger and my parents joked that my second child should be a Dragon, because they are the two most powerful signs in the zodiac, but my daughter was born one year later, as a Snake, so we now joke that she’s the little Dragon, since a Snake is sort of a little dragon. Right? No? Ok, so it’s a family thing. 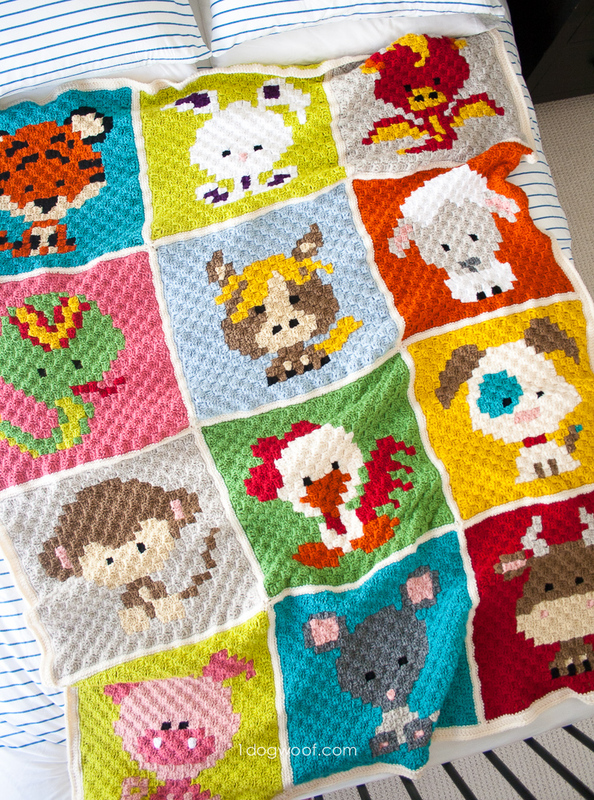 If you were to recite the zodiac in Chinese, I think it actually starts with the Mouse, but I started my blanket with the Tiger because of my son. 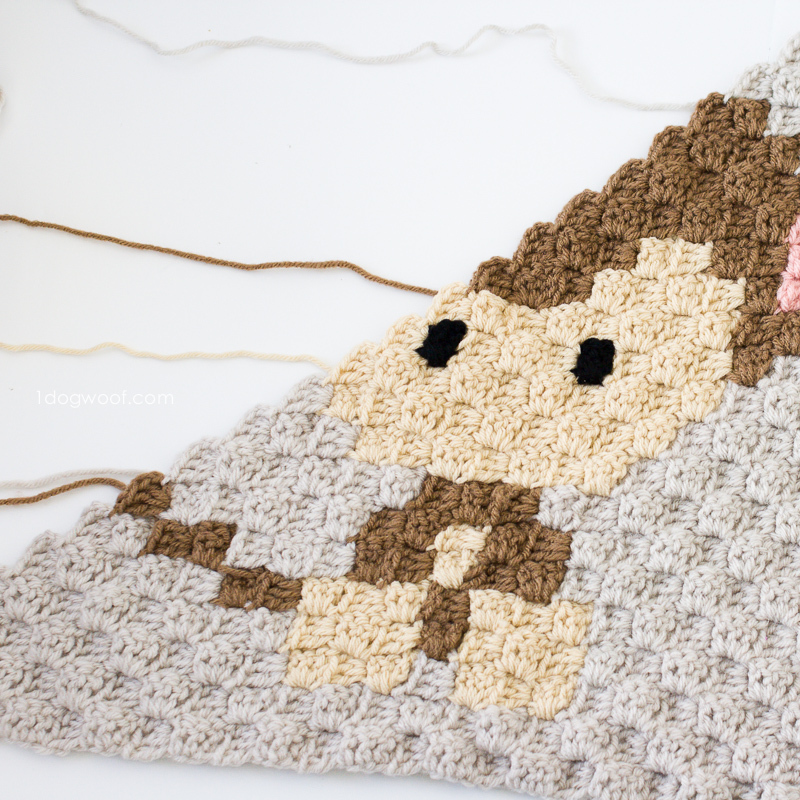 I chose the background colors for each of the squares based on that particular order, but your blanket is up to you! You can work the squares in any order you like, and follow the actual Zodiac order, or not. 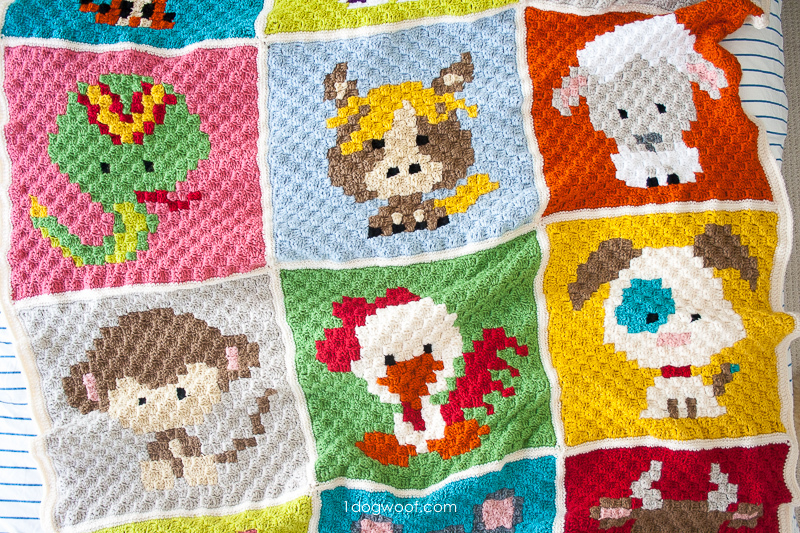 Each c2c crochet animal square is approximately 18 inches, with 23 c2c tiles on each side. 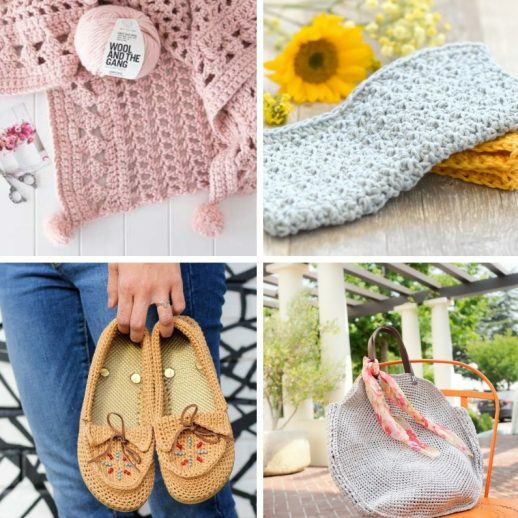 I chose to use colors from Lion Brand Vanna’s Choice Solids and Loops and Threads Impeccables solids – I found their colors to be vibrant and were able to match quite well with each other. Their yarn thickness also matched fairly well, so I could interchange the colors in the same square without adjusting my gauge and/or tension. I finished each square with two rounds of single crochet stitches worked evenly around the square, and then joined the squares together using the mattress stitch. Since the afghan is already pretty busy, I just did a plain border in white. 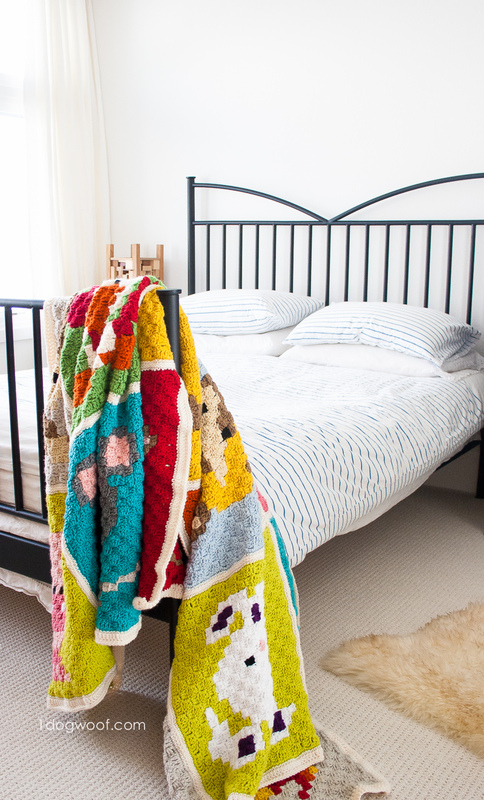 The pattern notes included in this post are for the afghan assembly instructions only. On my Zoodiacs page, you can find previews and links to all the Zoodiacs animals (I may make more in the future – Zebra, here I come! ), or purchase Zoodiacs pillows, mugs and prints from my Society 6 store. 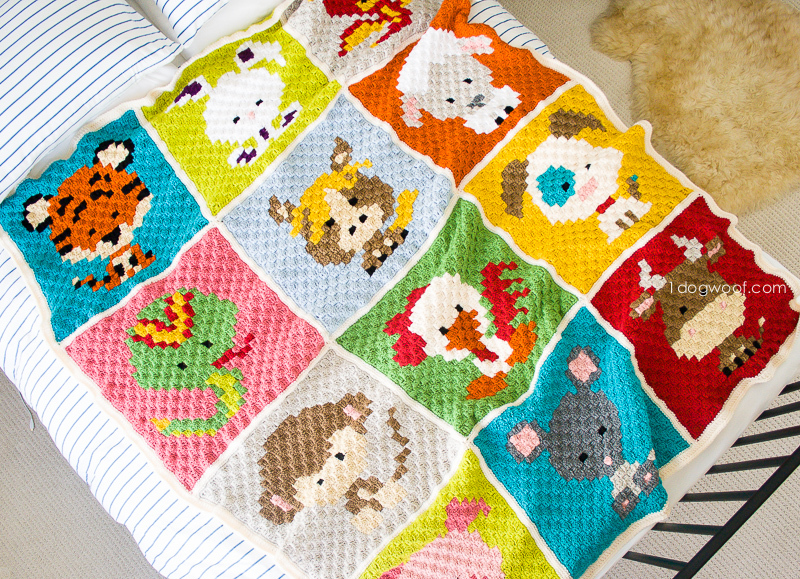 You can also purchase a printable Zoodiacs Afghan e-book, which is a compilation of all 12 Zoodiacs graphs at full-size, basic c2c instructions, pattern for afghan assembly, video links and pattern notes, all formatted as a printable PDF without ads or comments. 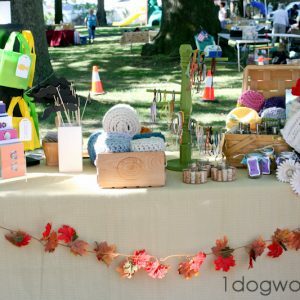 The ebook is available via Craftsy for US readers and Etsy for international readers. If you’re unfamiliar with c2c crochet, it’s following a graph working tiles at a diagonal, from corner to corner (c-to-c). 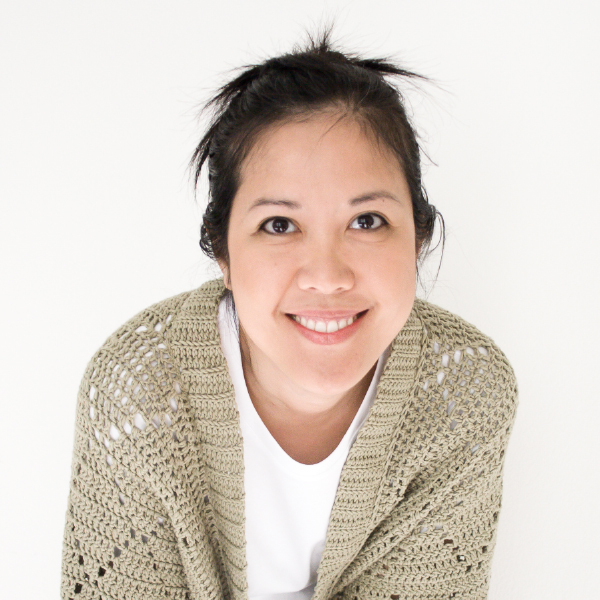 I’ve also seen it called key-tab stitch and it can be worked using double crochet stitches or half-double crochet stitches. I’ve put together a complete c2c crochet tutorial that goes over how to start the stitches, how to read a graph, how to decrease, change colors, and weave in your ends, with working notes, videos and an extra video of my crocheting a small sample c2c project, so you can follow along and see how I work! You can find the tutorial HERE. I-9 (5.5 mm) hook – I love my Clover USA Amour hooks*! I found it easier to work with 2 skeins of your background color for each square. 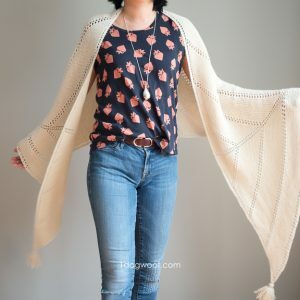 You always start with just 1 skein, but once the animal pattern starts, you’ll need another bobbin of the background yarn so you can work the background color on either side of the animal. 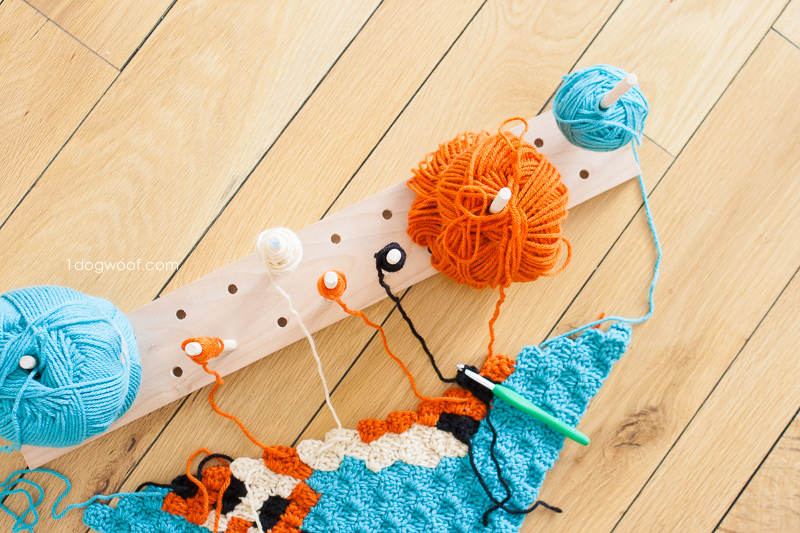 If you only have 1 skein, you’d have to either measure/estimate how much yarn you’ll need for either side, or keep joining new yarn onto your bobbin as you progress through the square. My yarn purchase recommendations assume that you use two separate skeins of background color yarn for each square. Some background colors are used twice and you’ll need the full yardages of both skeins anyways, so it’s easier to start both skeins simultaneously. Other background colors are only used once, and you may not need the full yardages of two skeins, but I still recommend both skeins if your budget allows for it. Because so much yarn is needed for this blanket, in so many colors, I tried to purchase them from Michaels during sales or with coupons. I was not as picky about getting the same lot color. I personally used Lion Brand Vanna’s Choice and Loops and Threads Impeccables, but RedHeart Yarns and Caron also have beautiful colors. At the end of each square, I used the background color yarn to work a round of single crochet stitches evenly around the square. For each c2c tile, I worked 3 stitches – 2 in the body of the tile, and 1 in the juncture between tiles – and then ch 2 in each of the corners. This gives a consistent 69 stitches + 2 ch stitches along each side. You can see this in action in my sampler video HERE. The instructions below assume that the first round of single crochet stitches (using the background color) has already been completed. I joined my squares using the mattress stitch. 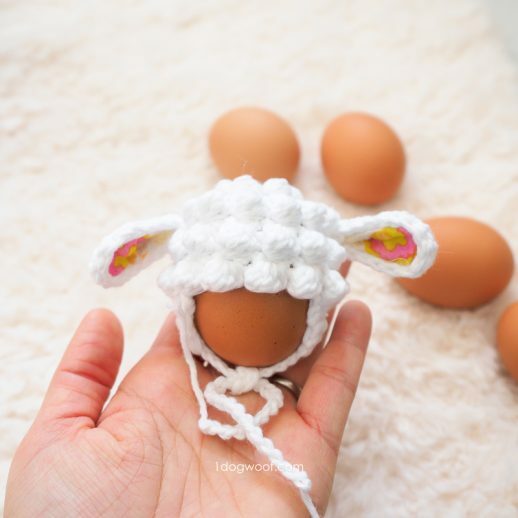 Since this is a sewing stitch, and not a crochet stitch, you’ll need to cut a piece of yarn that is at least double the length which you’ll be joining. For example, I joined the first two rows together, horizontally (Tiger to Snake, Bunny to Horse, Dragon to Sheep), so I needed a length of yarn that was twice (or triple) the length of 3 squares. It made sewing the squares really slow going, but I did that to avoid having to join yarn and having bumps in my blanket. I ended up having to join yarn for the vertical joins though, because the length was getting ridiculous. I also worked horizontal and vertical joins simultaneously to help with joining the corners. Pick a corner, and work a standing sc (video tutorial) in the first stitch after the ch 2 from the previous round. (Since there are 69 sc on each side, you’ll be starting with the first stitch on any side.) *Work 1 sc in each stitch across the side of the square. Work [1 sc, ch 2, 1 sc] in the ch 2 space. * Repeat from * for all 4 sides, and then join in the first sc with a slip stitch. Line up two squares together. 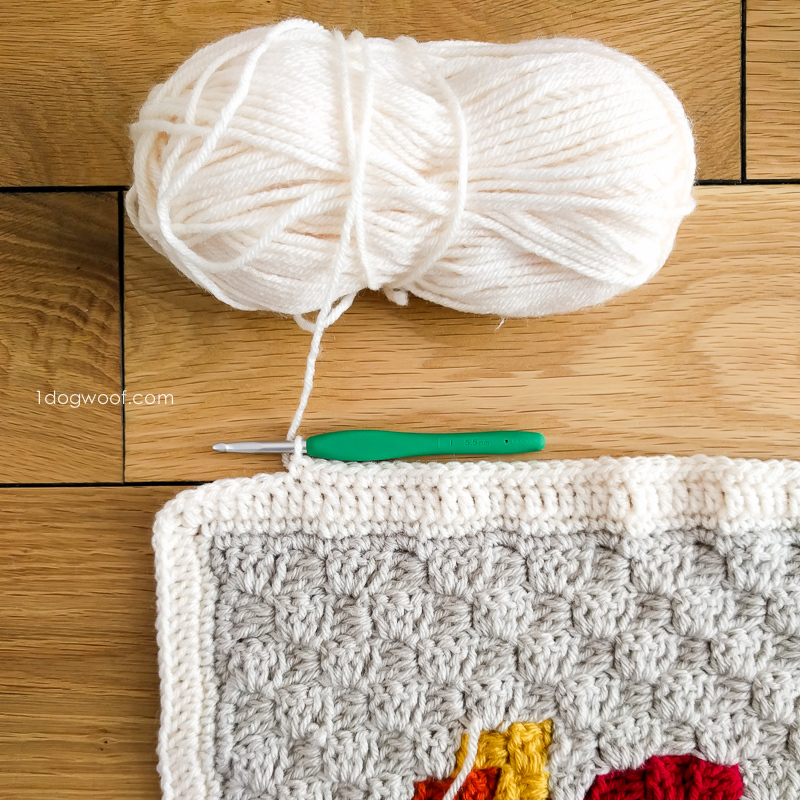 Work your needle from back to front on the first stitch of one square, leaving a tail. Work your needle from back to front on the first stitch of the other square, pull to tighten. Continue to work your needle from back to front of each subsequent stitch – 2nd st on one square, 2nd st on other square, 3rd st on one square, 3rd st on other square, etc. When you come to a corner ch 2 space, treat that as a single st. After working through one corner space, work through the corner space of the other square, then work through the corner space of the third square you’re joining. (eg: After working through the corner st on the Tiger, work through the corner st on the Snake, then work through the corner st on the Bunny, then work through the corner st on the Horse.) Afterwards, you can continue working the mattress stitch in each stitch. Once you come to the end of a row, fasten off, leaving a tail to weave in. Round 1: Start with a slip stitch anywhere along the outside border of the afghan. Ch 3. Work 1 dc in next stitch, and in each stitch around the entire afghan, working [1 dc, ch 2, 1 dc] in the corners. Join to first ch 3 with a slip stitch. Round 2: Ch 1. Work 1 sc into next stitch, and 1 sc in each stitch around. Work [1 sc, ch 2, 1 sc] in corner ch 2 space. Join to first sc with a slip stitch. Finally, weave in all ends, and you’re done! Congratulations!!! 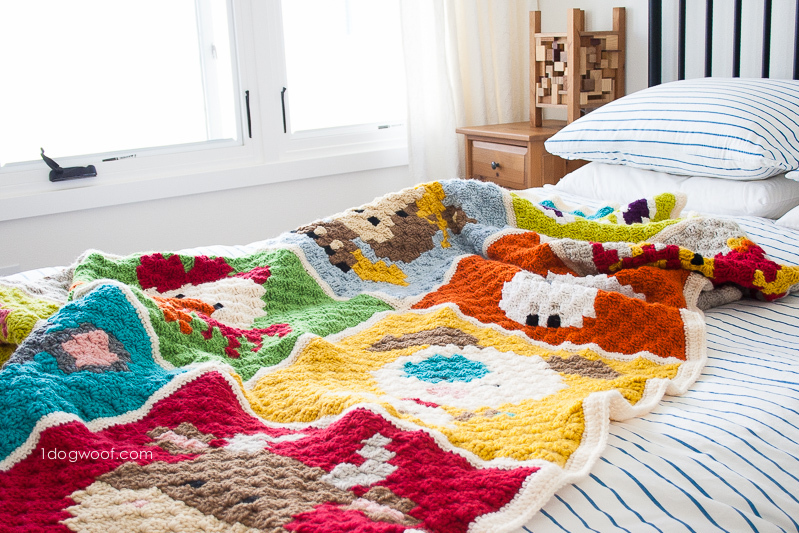 The Zoodiacs squares make for great projects whether you make just one, or complete the whole afghan. 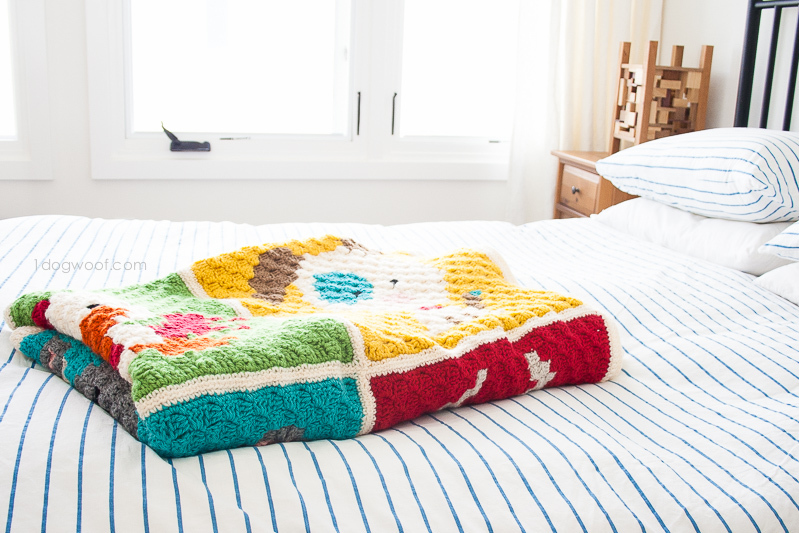 A single square worked in chunky yarn can be a lovely baby blanket depicting the year the baby is born. Or turn a single square into a pillow. Alternatively, combine all the Zodiac signs for your family into a keepsake blanket. I’ve also seen a reader work the Zoodiacs graphs in cross-stitch! There’s so many ways you can use these designs, and these signs apply to everyone. Be sure to share your creations with me on Facebook or Instagram! I can’t even! Thanks for showing how you did this, and for sharing so much information. I can’t make this, but I sure do appreciate that you made it! Unbelievably cute! The colors your chose are great. I never heard of this technique before, but I’ve tried it and I love it. Thank you so much for sharing. I’ve done a few practice squares, but I can’t wait to try one of the Zoodiacs. They are adorable. I think my granddaughter would love one. I have been trying to learn C2C and just keep messing up, but I love your Zoodiac afghan so much I will try once more. If I fail again can this be made with regular single or hdc stitches and follow the graph? Thank you so much. I don’t do c2c so converted the pattern on stitch fiddle to sc. 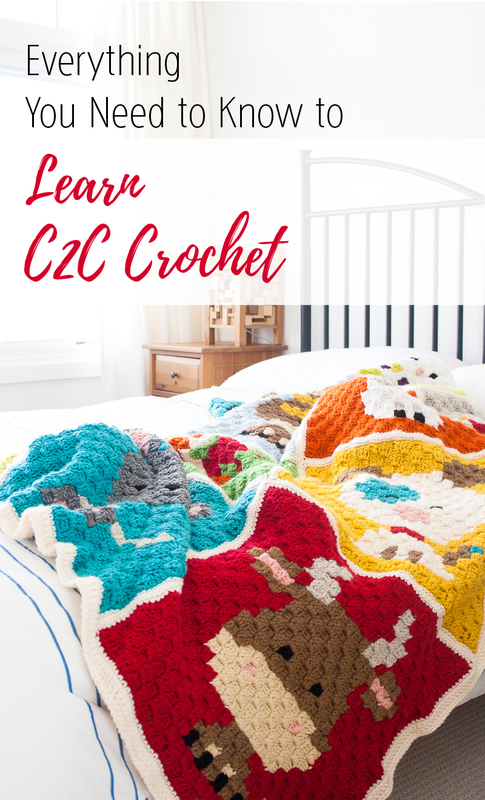 i am still afraid to try this c2c. This is the CUTEST ever!!! You are a genius. 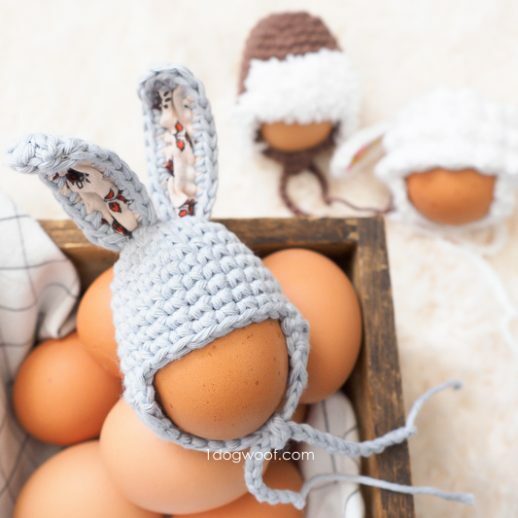 My daughter is planning to have a baby very soon, and I will SO enjoy making this for her! Thank you so much for sharing. Wow! This is amazing! I really want to try this. It reminds me of the manga Fruits Basket, but then it would also need a cat and a rice ball. 😀 Thank you so much for this detailed pattern! 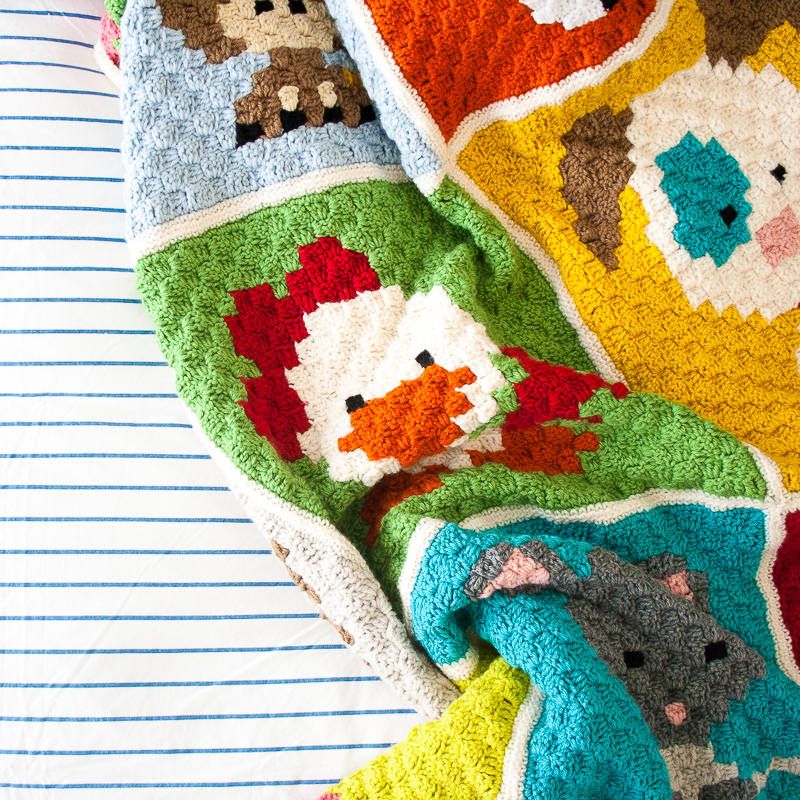 This is one incredible blanket!! Definitely going to make this. I have made several C2C afghans already and used the Vanna’s Choice and it makes up wonderfully. Thank you for this free pattern. Great job. Lovely bright colors. Would make a wonderful gift for a child. Thank you! And yes, Vanna’s Choice is great for afghans! It is absolutely the cutest thing ever. You are so talented! Your daughter is very lucky. You have sooooooo many ads on your site, I am unable to view ANY of your videos without f5 – 10 ads popping up and finally the whole computer5 freezes and I have to re-boot. Then I am stuck with all this malware and spyware. You really need to clean up your site. That is so disappointing. You have such gorgeous embroidery and all these ads spoil the experience you are attempting to provide. Vi, I’m sorry you are having a bad experience on my website. Hosting ads provides provides an income that helps pay for the website and my work. I do offer inexpensive ad-free versions of select patterns on my Craftsy or Etsy shops for purchase. Thanks for your feedback! Question, so you do a round of sc in background color and then 2 rounds of the white border before the mattress stitch? And are the white rounds a dc then a sc round? I have the same question. Thanks! Hey- I am working on a version of this but I am not sure if you use white or cream for the border? I can’t find where you say what colour to use. PLEASE email back I like the writing out ones better I always lose my spot on the craft ! Look lovely l will try one out.thanks! Just finished mine! It was my first c2c project and it took a while but it was totally worth it. I did mine with a hdc and ch 5 instead of the dc and ch 6 just to make it a little bit smaller. Thanks so much for sharing your amazing patterns! Yay! What an accomplishment, congrats! Hi! If I wanted to take one tile and make it a child blanket size, how would you suggest I do that? Thank you! I appreciate you taking the time and effort to putt this article together. I once again find myself personally spending a significwnt amount of time botfh reading and leaving comments. I thought it was a free pattern. Bumma. Loved this pattern. Originally I bypassed this pattern as it was to large for what I wanted it for (baby blanket for my nephew) I kept coming back to it. Anyway i managed to find a way to adjust it to make it smaller. I deleted the outside row all the way around and used a 4.25mm hook and only 1 round of sc border on each. This made each square 13 inches, this was still slightly larger than I had in mind but the afghan to cute to pass up. I just have the final border to complete and I am so excited to gift this!!! Thank you so much. I don’t have much luck blocking c2c so I started this as a continuous hdc and really pleased with the results.